One U.N. House welcomed the Undersecretary General for United Nations (Department for Economics and Social affairs), Liu Zhenmin, on Monday. 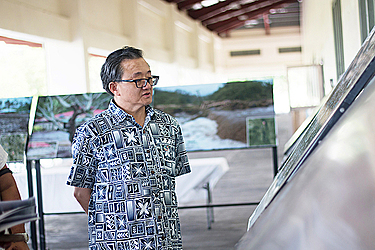 Liu Zhenmin is in Samoa for the S.A.M.O.A. Pathway, an inter-regional meeting of Small Island Developing States (S.I.D.S.). He will be working alongside different nations to help support their growing partnerships as they navigate shared challenges. In his visit to U.N. House in Tuanaimato, Liu Zhenmin was welcomed by staff members who work across several U.N. agencies, including Food and Agriculture Organisation (F.A.O. ), United Nations Development Programme, United Nations Environment Programme and U.N.E.S.C.O. For Mr. Liu, it was his first time in the Pacific, and he warmly thanked the group for inviting him. He encouraged them to continue working towards the Sustainable Development Goals, as their target of 2030 draws closer. “We need to be creative and innovative to our approaches with S.I.D.S. support,” he added. F.A.O. Sub Regional Coordinator, Eriko Hibi told Mr. Liu that she appreciated his visit to U.N. Samoa, and it was encouraging for the staff.